Toni Brendel recalls a “ruthless and barbaric moment in history” in Lidice: Remembered Around the World. Lidice was a small Bohemian village destroyed by Nazi SS troops in June 1942 in retaliation for the assassination of a top Nazi general. The village’s male residents were shot and killed and the women moved to concentration camps. The “sacrificial village” was intended to halt resistance to the Nazi regime. 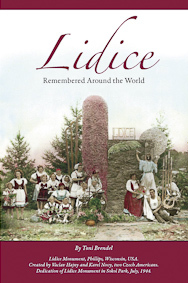 The author , as a 10-year-old child, attended a Lidice memorial service in the United States with her grandfather. The memory stayed with her and, as an adult, led her to research and visit Lidice in Czechoslovakia when it was under Communist control. That initial trip in 1987 was followed by three other trips, the most recent in 2011, during which she interviewed two children of the original Lidice villagers. Those interviews and others are contained in Brendel’s new book, an update of her earlier book of the same title.